Rarely in the history of athletics in Scotland can the agony and ecstasy of sport been played out in quite such dramatic and contrasting fashion as the Gold Coast 2018 Men’s marathon. 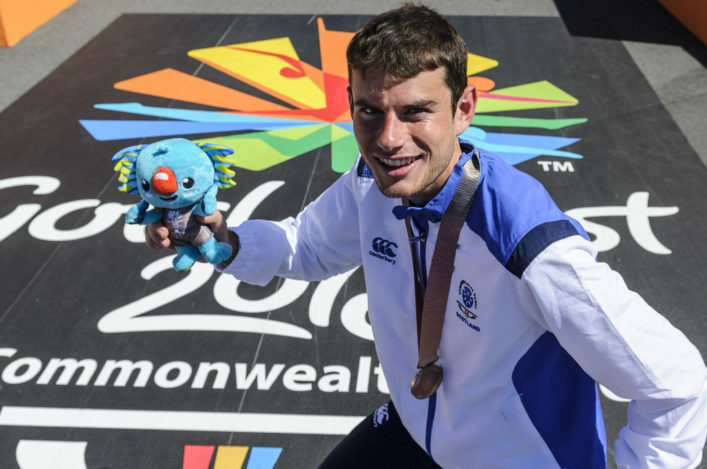 Robbie Simpson landed a bronze to take the fifth Team Scotland medal in athletics and our first in the men’s marathon since a silver for Jim Alder in Edinburgh in 1970. Callum Hawkins, a long-time leader of the race in conditions akin to a furnace, ultimately has DNF next to his name. Those two sentences and the phrase ‘mixed emotions’ don’t begin to cover Callum’s awful collapse less than 2.5K from the finish line with a lead of just over two minutes from Aussie favourite, Michael Shelley, who ultimately took gold to successfully defend the title he won at Glasgow 2014. Across the globe spectators and TV viewers watched in horror as Callum recovered from a first fall to carry on running before then hitting the tarmac again. It soon became clear that he could not continue and questions remain about the speed of the medical service supplied by the race organisers. In fact, team-mates Steph Twell and Lynsey Sharp were among the very first people to reach Callum and assist him. Shelley and Uganda’s Solomon Mutai pushed on for gold and silver in 2.16.46 and 2.19.03 before Simpson came home for a superb third under all the circumstances in 2.19.36. Robbie had been 12th at halfway and while he had hoped to work his way through the field he admitted he never entertained the prospect of the podium until very late in the race – still looking round when entering the finish straight in front of packed stands, including mum and dad Anna and Graeme and his French girl-friend, Ginie. ‘I’m absolutely delighted to get the bronze but I’m disappointed for Callum, who couldn’t make it to the end because he was going so well,’ said Robbie. ‘I really felt bad passing him lying on the ground like that. I wanted to help him but there was assistance with him at the time and I don’t think there is anything I could have done – I wasn’t feeling great myself. ‘It was a case of thinking ‘I need to get to the line before the same thing happens’ and try and hold on to a medal. ‘I just tried to run a smart race and come through and in the end I managed to do it, but it was really tough. ‘It makes the past six months worthwhile and I’ve put in thousands of miles for this – up at 118 and 115 for some weeks back in the winter. When I came out here first I really struggled with the conditions and it was only in the last fortnight or so I felt better about it. ‘I did think all along that it would not be won in a fast times – it is just not possible when it is close to 30 degrees. Simpson was thrilled to hear it is 48 years since Alder’s silver in the men’s marathon – as he added Commonwealth bronze to the same colour in the World Mountain Running Champs in Wales three years ago. Team Scotland issued a statement shortly after the race, with Callum quite quickly on the way to recovery. 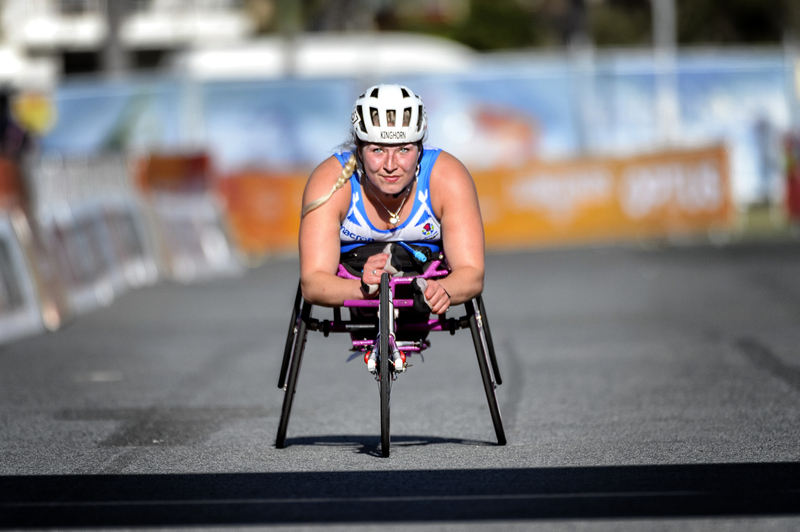 Sammi Kinghorn suffered podium heart-break for the second time in five days as she finished fourth in the T54 Marathon. 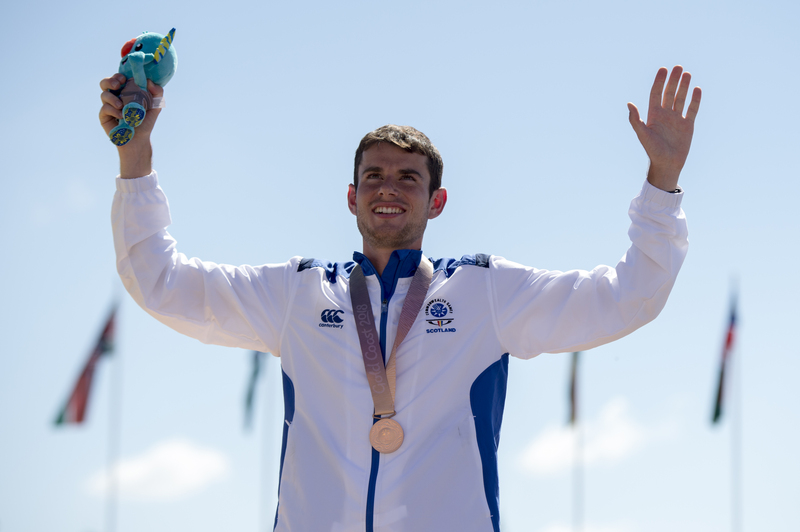 The Team Scotland double World Champion in the sprints, Sammi was fourth in the T54 1500m final last Tuesday and came home in the same position early on Sunday morning in Australia some 42 seconds behind Engish bronze medallist, Jade Jones. Aussie gold medallist, Madison de Rozario, took her second title after also winning the 1500m on the track – four years after she flew to Scotland but missed out on Glasgow 2014 after contracting DVT on the flight. 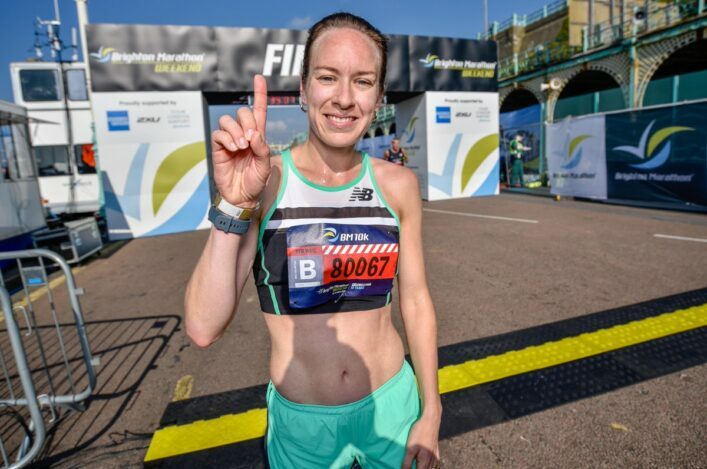 Sammi , who is coached by Ian Mirfin, will now take a long holiday in Australia and there will be a lengthy and maybe permanent break from the marathon. Sammi Kinghorn: ‘I am gutted. I tried to so hard to stay with the leaders and did so for a very long time. In fact, we went at it so hard early on that I have set a PB for the half marathon. ‘I gave it all I could and to finish fourth for the second time this week is agonising. It just feels like the worst position in some ways because you are so near yet so far from being on the podium. ‘I don’t know if I will be doing marathon again – maybe when I am older but not any time soon. I actually didn’t feel too bad until the last mile and a half or so. ‘But I want to be Paralympic champion in the sprints. 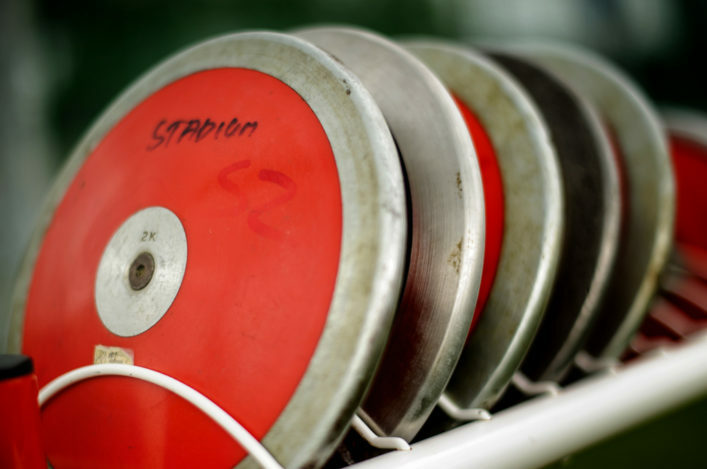 I want to get inside 16 seconds (for the 100m, not yet achieved by a T53) – I just want to be fastest, not go the furthest! ‘I’m chuffed for Maddy, the winner. 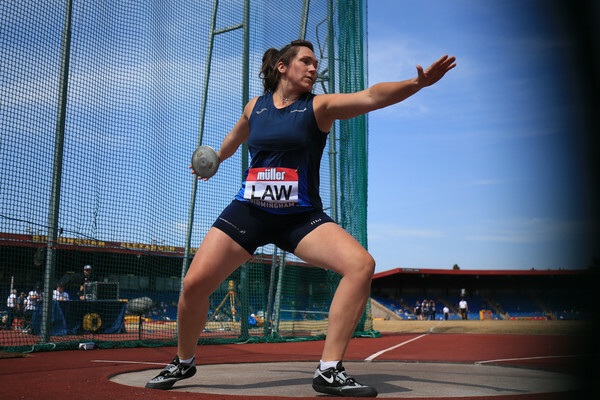 She came over to Scotland for Glasgow 2014 but developed DVT on the plane and could not compete. I only heard that recently because at the time I thought it was a shoulder injury. That must have been awful for her but now she’s won double gold in front of the Aussie crowd – it’s that home advantage factor again, isn’t it?